The Brooks cherry has all the trademark characteristics of the ideal cherry. They have a rounded heart-shape, glossy firm skin that snaps with each bite, and an intense red flesh that will stain to the touch. It has a well balanced sweetness with rich complex flavors of dried spice and sugar and a perfectly sweet tart blackberry-like finish. Though when fully ripe their deep maroon coloring is more like that of a black cherry, the Brooks has been compared to the common red Bing cherry in quality and flavor. Brooks cherries are available in late spring. 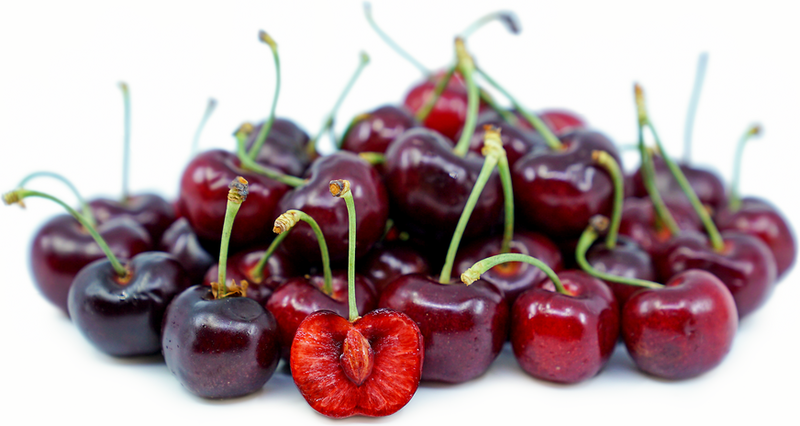 All cherries are members of the family, Prunus and are descendents of the wild cherry, Prunus avium. They are classified as stone fruits, alongside apricots, plums, peaches and almonds. 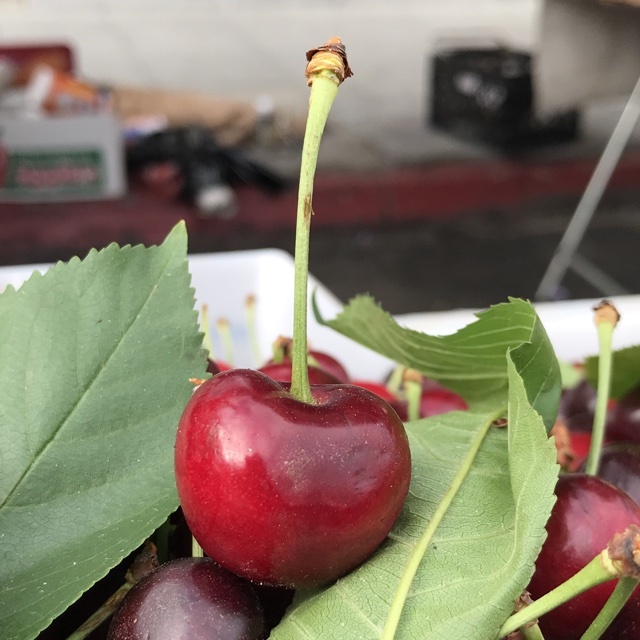 The Brooks cherry is a hybrid of the Burlat and Rainier cherry, combining positive attributes of both parents with independently advantageous characteristics resulting in early maturing fruit with superior flavor. The Brooks cherry is classified as a sweet cherry. Sweet cherries are self-incompatible so pollination is absolutely essential for production. The honey bee is the chosen main pollinator. Red fleshed cherries inherently contain anthocyanins. Anthocyanins are potent antioxidants that are being heavily researched for their potential health benefits, including anti-inflammation and pain reduction. They are also a good supply of calcium, iron and vitamins A and C.
Brooks cherries make an excellent choice for fresh eating, but are also suitable to cooked applications in both sweet or savory dishes. The natural sweetness and sturdy texture of a Brooks cherry make them ideal for preserves and baked goods, but they also make an excellent stuffing to pork or duck when combined with sage, bacon and onion. Other common flavor affinities include, burrata, feta, mascarpone, brie, basil, nuts, fennel, pistachios, arugula, yogurt, cream, dark chocolate and berries such as blueberry and blackberry. They have a relatively short shelf life, thus they should be eaten within a few days of being picked. The Brooks cherry was developed at the University of California, Davis by P.I. Hansche, W. Beres, J. Doyle, and W.C. Micke in 1969. The University has played a pivotal role in the development and marketing of sweet cherries throughout the state of California. The Brooks cherry was developed at the University of California-Davis and released to the public in 1987. 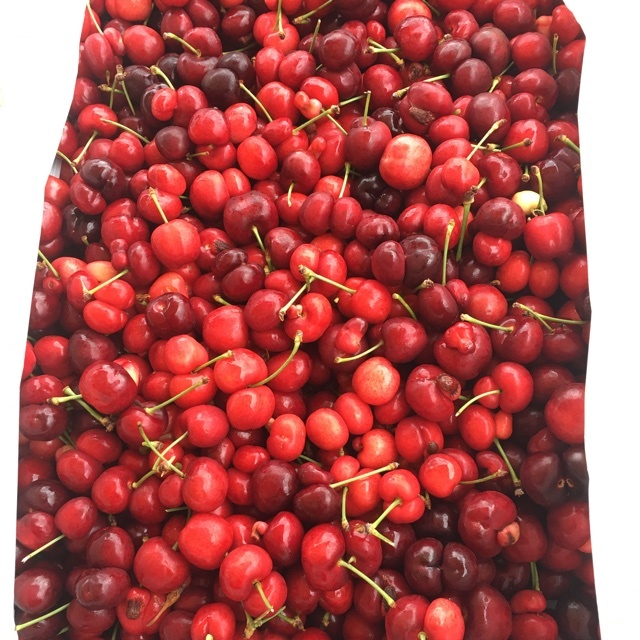 It is an early season cherry whose ability to tolerate hot climates has allowed the cherry season to be extended up to a month earlier in California.  At Murray Family Farms, during the hot days of December and January winter months, they run sprinklers to lower the tree and ground temperatures to prevent the cherries from blossoming early and experiencing any early unnatural season. Recipes that include Brooks Cherries. One is easiest, three is harder. 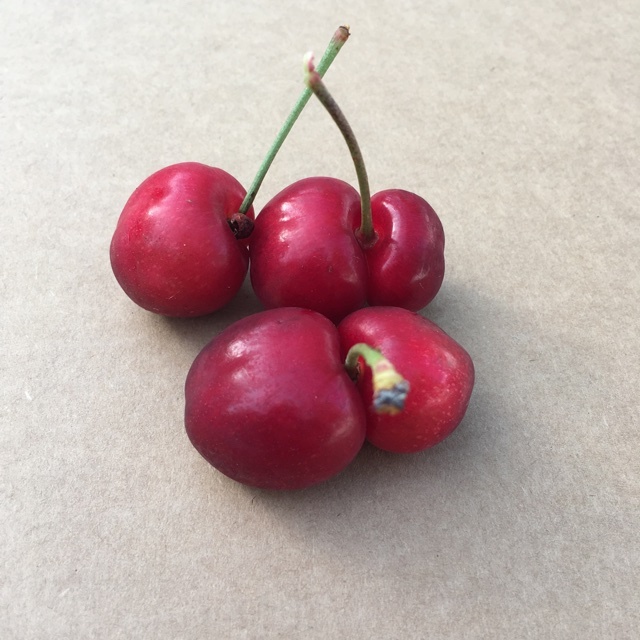 People have shared Brooks Cherries using the Specialty Produce app for iPhone and Android. 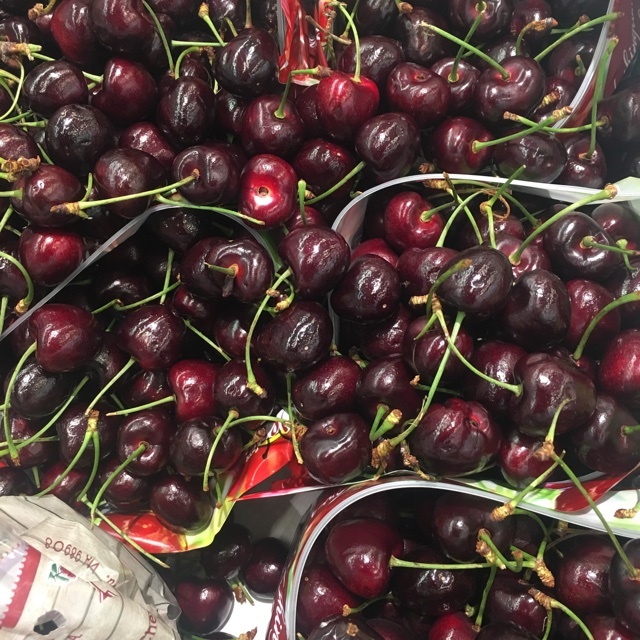 Sharer's comments : Brooks Cherries spotted at Walmart Supercenter. 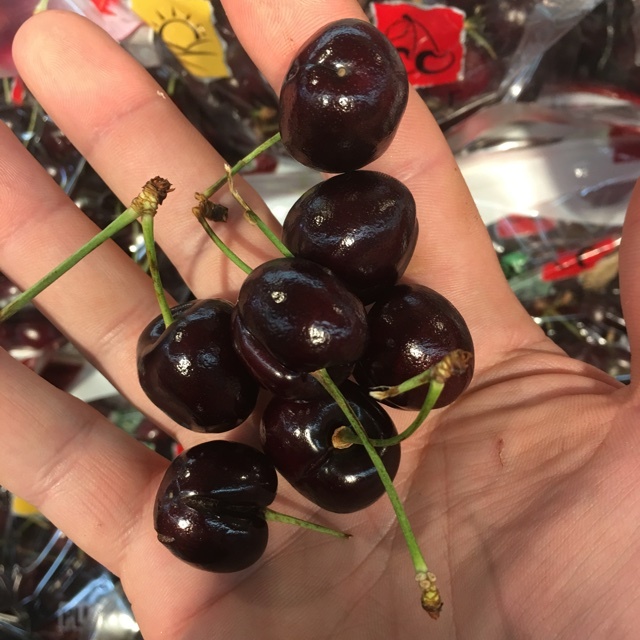 Sharer's comments : Brooks Cherries spotted at Little Italy Mercato. 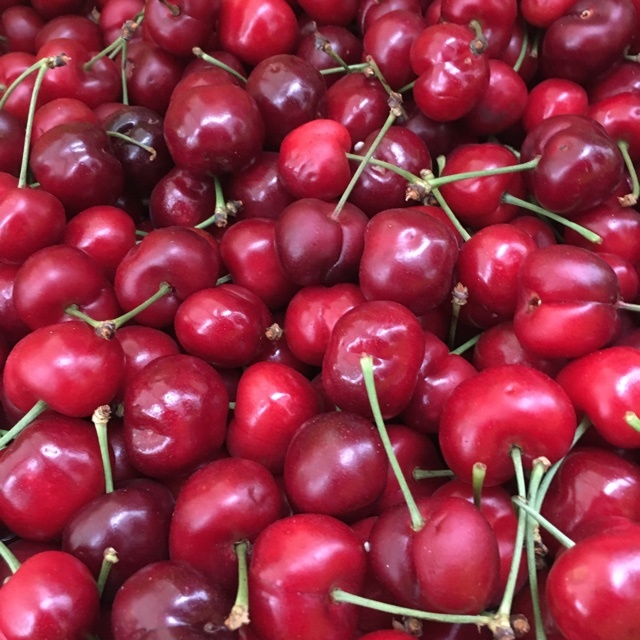 Sharer's comments : Brooks Cherries spotted at Second Street Market. Sharer's comments : Brooks Cherries spotted at Del Mar Farmers Market. 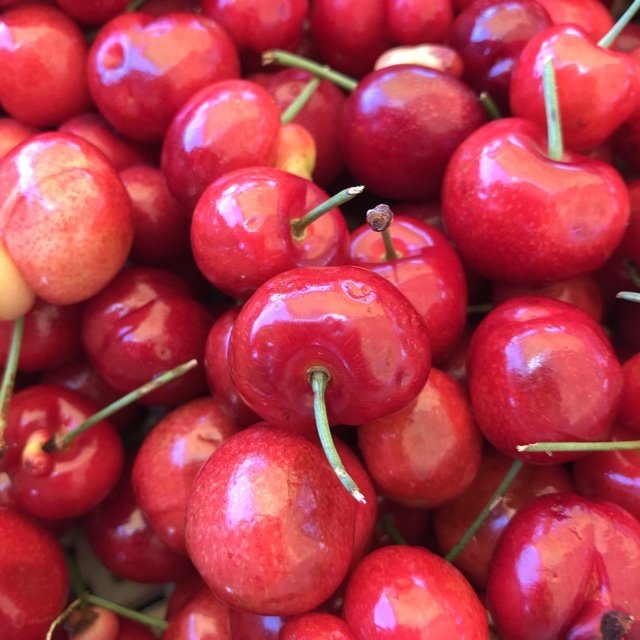 Sharer's comments : Brooks Cherries spotted at Vista Farmers Market. 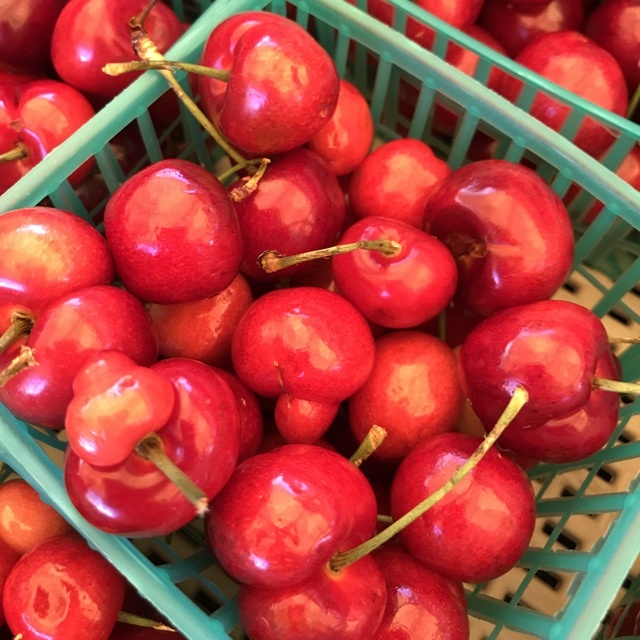 Sharer's comments : Brooks Cherries spotted at Culver City Farmers Market. Mild sweet/tart cherry. Sharer's comments : Brooks Cherries spotted at Santa Monica Farmers Market. First of the season from Summer Harvest Ranch. 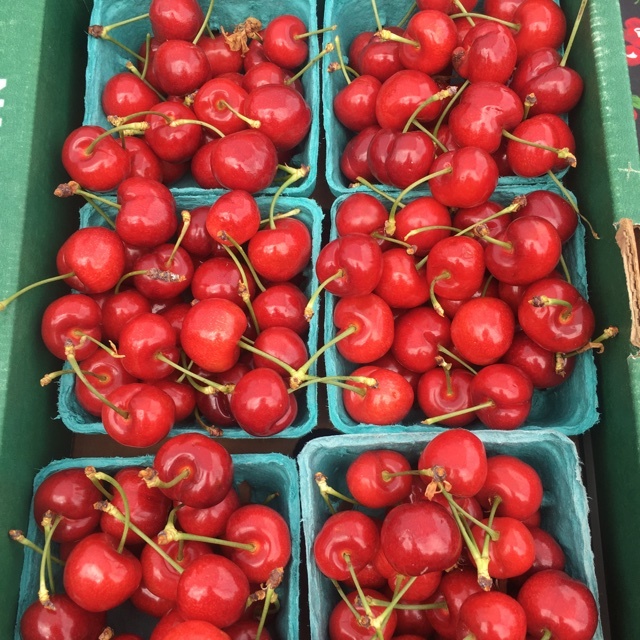 Sharer's comments : Brooks Cherries spotted at Virginia Park Farmer's Market. First of the season from Murray Family Farms.